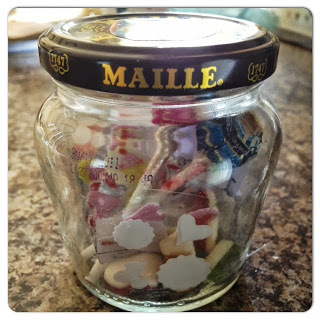 Today we are featuring a guest post from the lovely Custard and Crumble on the subject of ‘Word Jars’. I absolutely love this idea, and will be having a go with my 5 year old during the summer holidays! I can’t believe my little girl has just turned 5! She’s nearly finished her reception year now and of course one of the major challenges for her (and us) has been learning to read. Of course at the moment reading is taught mainly by phonics but there are also a number of “tricky” words that don’t always follow the phonetic code and it is these that she is having a bit of trouble with! Therefore I have been doing a bit of internet research about how to help encourage literacy and teach these harder words and I’ve become quite interested in “high frequency words”. There are about 150 high frequency words in the English language – learn just 50 of these and you will be able to read 25% of any text. Learn all 150 and you should be able to read 50% of any text. I really like this idea and as my daughter has a great memory I think this will work really well for her combined with phonics knowledge. But I wanted to make learning these words fun and add a bit of interest to what is essentially a memorising task. So I have created a word jar for her. 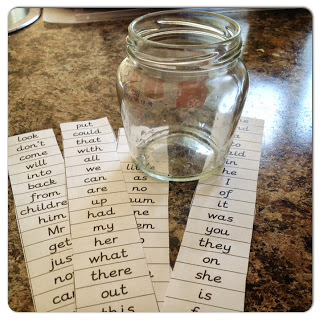 I printed off the high frequency words and cut them up into individual words and put them into a jam jar. I then filled the jar with a mixture of sweets and treats. The idea is that we pick 5 words from the jar each day to practice and as a reward she gets to pick a treat! It seems to be working well at the moment and I’m hoping we will see real steps forward with her reading! What a lovely idea. And how pleased will her teacher be come September! Will certainly be a happy Year 1 teacher in September! It’s a great idea, and something I will definitely be trying with Jacob over the summer!